Each year, the CE National Board of Directors select an individual or a couple for the Wall of Honor who have had a significant influence upon the lives of others by their ministry and equipping of others to serve. This influence includes one or more of the following: providing ministry training, training others in evangelism, providing acts of service to the organization, involvement in encouragement, discipling others, and modeling a godly Christian life. 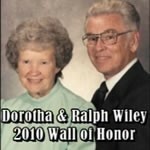 Go to the CE National Wall of Honor page to view the video honoring the contribution of the Wileys for the cause of Christ. Ralph Wiley had a huge impact in the life and ministry of the Fellowship of Grace Brethren Churches since he began at the Grace Brethren Church in Galion, Ohio, in the early 1960s. After serving as Protestant Chaplain at a prison in Marion, Ohio, for about 28 years, he retired early and began serving as interim pastor in many churches in the Fellowship: Akron Ellet (twice) and Minerva in Ohio; Charlotte in North Carolina; Orlando, Maitland, Okeechobee, Fort Lauderdale (twice) and Sebring (twice) in Florida. He was with the Sebring church when he went to be with the Lord in January of 2008. Wiley served with CE National for several years as a Senior Adult Coordinator. He and his wife Dorotha have also invested deeply in missions through our Grace Brethren International Missions, with special burdens for the pygmies in Africa and the church-planters in the Philippines. The Wileys also left a living legacy in the Fellowship as their son Galen Wiley is pastor at the GBC in Lancaster, PA, granddaughter Letitia Yoder with her husband Mike has served with Grace Brethren International Missions as a missionary in Berlin, Germany; grandson Jonathan Wiley with his wife Kim is on the pastoral staff at the GBC in Columbus, Ohio; and granddaughter Katrina Walker with her husband Cort was involved at the Liberty GBC in Johnson, PA, as their first pastor for several years.